For the Anveo Mobile App we offer very flexible licensing. Choose between two different licensing models – based on users or solution size. The Anveo Mobile App users is licensed according to the number of named users. Each Anveo app user can use up to three devices. Depending on the circumstances there is always a fitting solution. For further support, feel free to contact us. For each window to be displayed in the Anveo Mobile App an Anveo Page Element is required. For the different operating systems no different Anveo Page Elements are required. By licensing the Anveo Mobile App on the number of users, the number of Anveo Page Elements is unlimited. By licensing according to the size of your Anveo Mobile App solution the number of users is unlimited. A Microsoft Dynamics 365 Business Central or Microsoft Dynamics NAV license for using Anveo Mobile App is required. For questions, please contact your Microsoft Dynamics partner. How do I get the Anveo Mobile App? Anveo Mobile is usually available through your Microsoft Dynamics partner. Your partner gets our software, training materials and support options. Upon request and after existing Microsoft Dynamics Partner approval direct setup and assistance is available. US Dollar prices apply to customers from Australia, New Zealand, Canada, USA and the rest of America. For all other countries, our prices apply in Euro. Are you a Microsoft Dynamics user evaluating the Anveo solution? Does Anveo meet your business needs? Or are you looking to test Anveo’s mobile solutions on your own infrastructure with your own data? Are you a Microsoft Dynamics Partner needing assistance in estimating a client project leveraging an Anveo product solution? We present our solution in a workshop on the customer’s site. Our team will analyze business requirements used to build a project quote and a solution plan. In the run-up to the workshops, we will check the compatibility of devices and software and install Anveo Mobile App or Anveo Web Portal on the customer’s demo environment. This Installation can be used for the following developments. Following the workshop, the customer can test the Anveo Mobile App for 30 days. Put Anveo through its paces on your own infrastructure and with your own data. 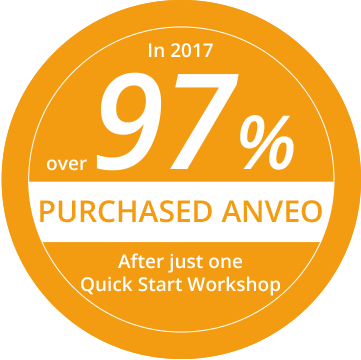 Are you interested in the Anveo Quick Start Package? Quick Start Workshop will be typic ally done together with the customer’s Dynamics partner. If you require further information please contact us by using the contact form on the right or by phone: +49 (0) 40 211 078 100. Connect your mobile sales team to Microsoft Dynamics. Give your sales personnel access to their debtors, contact details, quotes and orders, product data and stock information and prices. Optimize with the Anveo Mobile App your sales process significantly, for example orders are transmitted directly to your ERP system after the meeting. Save valuable business time. Support your service technician in their daily work. With the Anveo Mobile Service App your technicians receive a easy access to show all important data, such as service orders, service products and customers from Dynamics to your tablet PC or smartphone. So you can optimize your processes digital, detailed task description and documentation – including photos, which are also available in Dynamics.